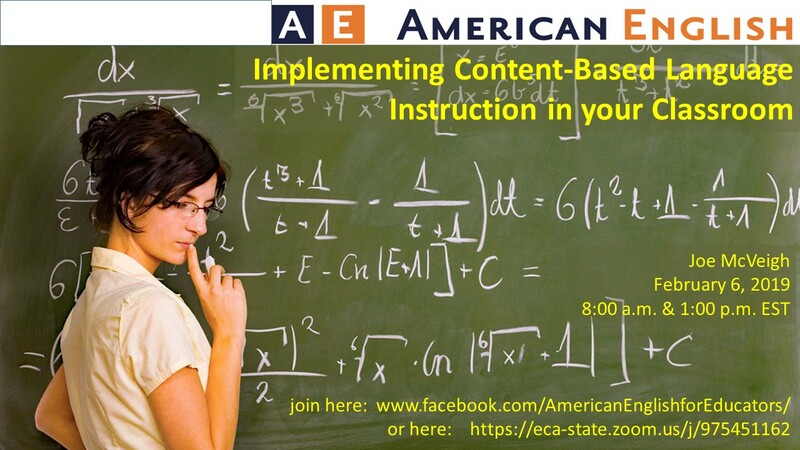 I hope you’ll join me for a webinar on Implementing Content-Based Language Instruction in your Classroom. It is sponsored by the English Language Programs of the U.S. Department of State. The webinar will be offered on Wednesday, February 6th at two time: 8:00am and 1:00pm EST. You can attend either session. There are two ways to join. 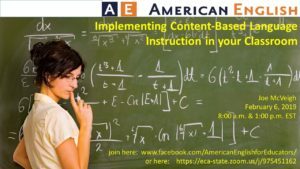 1) Join the live stream on Facebook at www.facebook.com/AmericanEnglishforEducators. If you visit that page now, it appears to be static, but the live video feed will begin just a few minutes before the hour we begin. If you aren’t a Facebook user, join us using the Zoom platform at this address: https://zoom.us/webinar/975451162. You will need to take just a minute to download the Zoom software on your computer. Did you miss the webinar? A recording will be available shortly after the session.